We demonstrate the open-source Semantic Analytics Stack (SANSA), which can perform scalable analysis of large-scale knowledge graphs to facilitate applications such as link prediction, knowledge base completion and reasoning. The motivation behind this work lies in the lack of scalability of analytics methods which exploit expressive structures underlying semantically structured knowledge bases. The demonstration is based on the BigDataEurope technical platform, which utilizes Docker technology. 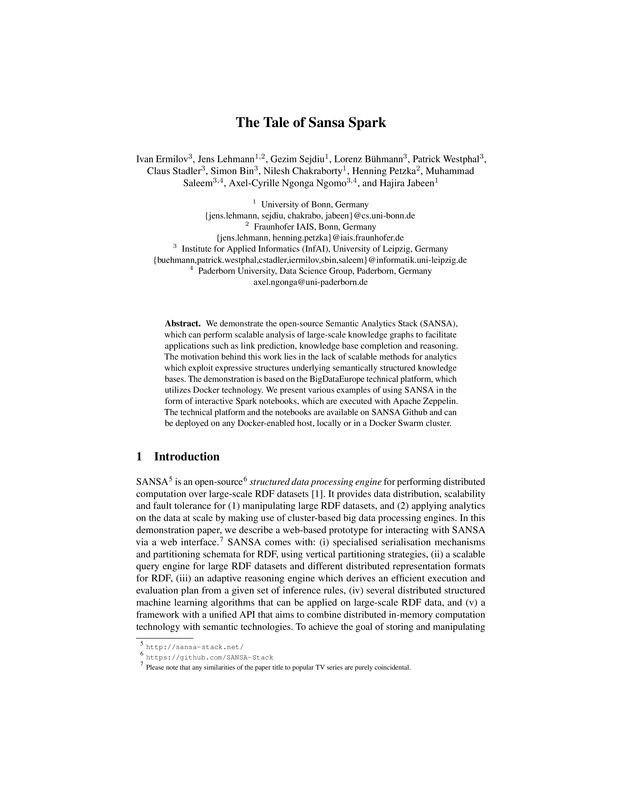 We present various examples of using SANSA in a form of interactive Spark notebooks, which are executed using Apache Zeppelin. The technical platform and the notebooks are available on SANSA Github and can be easily deployed on any Docker-enabled host, locally or in a Docker Swarm cluster.